The papers in this book were prepared for the 1983 AAPM summer school at Fairleigh Dickinson University in Madison, NJ. 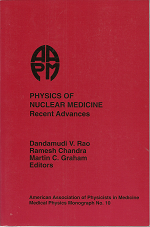 The book describes the current state of the art with respect various aspects of nuclear medicine. Particular emphasis was on camera design, radiopharmaceuticals, dosimetry, computer applications, single photon tomography, and positron emission tomography. Dandamudi Rao, Ramesh Chandra, Martin Graham, eds.